Queen Beatrix of the Netherlands will officially re-open the Rijksmuseum next week, marking the end of a painful restoration project. The work at the Dutch state museum in the heart of Amsterdam ran five years over schedule and millions of euros over budget. The Rijksmuseum has been closed since 2003. Renovation was delayed by flooding, asbestos and a dispute over access for cyclists. “It was kind of Murphy’s Law,” says museum director Wim Pijbes. On Wednesday, Johannes Vermeer’s The Milkmaid was re-hung, making it the last major work to return to the museum. The painting sits in the Gallery of Honour, a breathtaking cathedral to the Dutch Golden Age, showcasing works by Rembrandt, Jan Steen and Franz Hals. The old masters draw the eye, but so do the intricately decorated ceilings and pillars that frame them – all painstakingly recreated after being painted over in the post-war years. In the halls flanking the grand gallery, the decoration is more modern. British artist Richard Wright, a former Turner Prize winner, has dusted the ceilings with almost 50,000 stars, hand-painted in a swirling, shifting constellation. It all serves to set up the Rijksmuseum’s biggest star – Rembrandt’s Night Watch. A gigantic Baroque painting of 17th Century city guards teeming with drama and movement, it is the only work to be hung in its original place. “Everything has changed,” says Taco Dibbits, the museum’s director of collections. “We have more than one million objects and we used to display them by material. You had a gallery for glass, a gallery for porcelain, a gallery for paintings. The Rijksmuseum’s paintings mingle amongst cabinets, kitchenware, magazine covers, dolls’ houses and pottery in a splendid, higgledy-piggledy array. It illustrates the cross-pollination between decorative and visual art – for instance, how Japanese prints inspired a Parisian vase-maker, whose designs prompted Van Gogh to paint Amandelbloom In Bloel (Almond Tree In Bloom) – but it also presents some striking juxtapositions. In the 20th Century Gallery, a kitsch German chess set, with snipers as pawns and a Panzer tank for the kings, is vaguely comedic, until visitors notice the Auschwitz prison uniform worn by 16-year-old Dutch girl Isabel Wachenheimer, which hangs silently nearby in grim disapproval. In total, there are 800 years of Dutch history retold in more than 8,000 objects across the Rijksmuseum’s 80 galleries. There is a brand new entrance hall in the shape of a voluminous atrium, flooded with natural light from the five-storey-high glass ceiling. Wim Pijbes describes it as Amsterdam’s equivalent to Tate Modern’s Turbine Hall – a free-to-enter public auditorium which will host performances, parties and new exhibits. By tunnelling under a cycle path that runs through the centre of the museum (the proposed closure of which caused uproar) it unites the east and west wings for the first time. It also created a few headaches. “We found beautiful new spaces, but being below the building means you dig into water,” Wim Pijbes says. In fact, with Amsterdam already under sea level, digging down meant the Rijksmuseum flooded. Workers floated around in dinghys as they fought the water table. Even now, skeptics wonder if the museum is jeopardizing its collection. “For foreigners, it is really frightening to be under sea level, and even more frightening to have the collection below sea level,” says Wim Pijbes. He insists that “complex engineering work” means the lower galleries are safe. But these aren’t the only measures taken to protect the artworks. The museum is newly illuminated by 3,800 individual LED lights, which lack the paint-destroying heat and UV rays of incandescent bulbs. They were installed by Dutch lighting specialists Philips, who also claim the LEDs enhance the viewing experience. 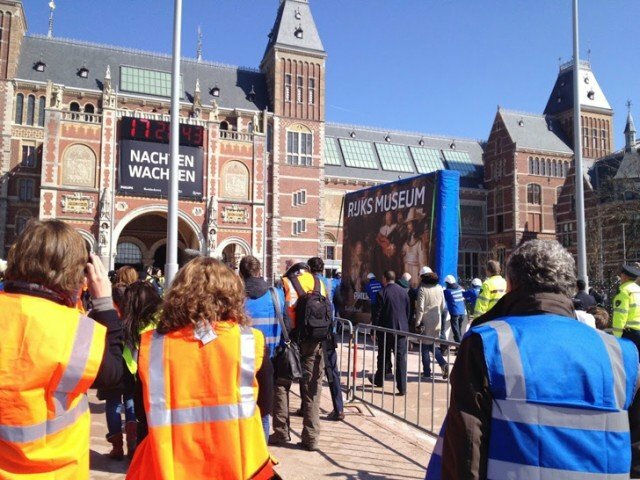 Visitors will get to decide for themselves when the Rijksmuseum throws open its doors on April 13. After the gala opening, hosted by the abdicating Queen, the first day’s entry will be free. After that, the directors predict more than two million people will come to the gallery every year, restoring it as one of Europe’s most important museums.